It’s virtually impossible to reach the parenting finish line in today’s world without some feelings of guilt: guilt for yelling; guilt for not providing things we want to give our child or for spoiling by giving too much; guilt for being too hard on our child; guilt for being too easy. Guilt can serve a valuable purpose in life: it tunes us in to the fact that we’ve done something or behaved in a way that we’re not okay with, morally or spiritually. We regret something we’ve done and guilt allows us to remember we don’t want to do it again. Guilt is like a prison sentence. Many parents are quick to be their own judge and jury and sometimes we end up serving a life sentence for a misdemeanor. Is that suitcase of guilt really mine to carry? Many times we take on guilt that’s not ours to shoulder. “I left my child’s father because he was verbally abusive. Now when my daughter visits him, I feel guilty that I’m not there to protect her from his behavior.” This mom is taking responsibility for her ex’s behavior and beating herself up for making a choice that was positive for herself – and her daughter – in many ways. Feeling guilty for causing another person to act in a certain way – even if it’s your child – is taking on responsibility for someone else’s behavior. In effect, you’re giving yourself a lot of power over someone else that you really don’t have. Remember: we are all responsible for our own choices. Period. If you’ve given in to your child ninety-nine times and let him play video games when he’s grounded, then on the one hundredth time you say no, and he chooses to throw the game across the room – who is responsible? Is it your fault that he threw the game because he expected you to give in again and became frustrated when you didn’t? No. Could you do things differently by staying consistent in your discipline? Certainly. But he still chooses how he will react and behave. What purpose is my guilt serving? In the above example, there was absolutely nothing that mom could do about her ex’s behavior toward her child. It wasn’t verbally abusive to the point that the authorities could be called. He was just often irritable and impatient. Not pleasant, but not enough to restrict his parental rights. So what could mom do? Sitting around all weekend worrying about her daughter and feeling guilty for leaving the man served no purpose and didn’t help her daughter one bit. In the second example- where mom felt guilty about giving in so much to her son that it affected his behavior – there was the opportunity for her to do something different. Every situation offers the chance to improve our parenting. But feeling guilty and blaming yourself for a child’s negative behavior can often backfire. It can lead us to be even less consistent in following through with consequences, for fear of making our child’s behavior worse. And it really is a disservice to our child: it sends the message that he doesn’t really have the capability to control his own behavior and make positive choices for himself. Is my energy better spent elsewhere? In other words, are there things you can do instead of focusing on feelings of guilt for things done in the past? In the above example, mom found it was much more productive –and she felt much better – to spend time teaching her daughter the necessary skills in order to set boundaries and cope in a positive manner when you encounter someone who’s not so nice. Guilt is distracting – it keeps us from taking positive action toward making changes. It’s a Parent Paralyzer. If you feel your child is behaving negatively – arguing, yelling, hitting or throwing things – because of something you’ve done, instead of spending time beating yourself up about it, redirect your own energy. Spend that time teaching your child how to cope with emotions such as anger, disappointment or frustration. You can never get yesterday back – but you can claim today and lay the foundation for tomorrow. Has your sentence been served? Guilt is like a self-imposed prison sentence. If there’s something specific you feel guilty about, ask yourself, “Is it time I was paroled?” How long should I continue to feel guilty about this? One of life’s biggest challenges is often forgiveness: forgiveness for others (including our child) and forgiveness for ourselves. By forgiving yourself for mistakes you’ve made as a parent, you are saying, “I acknowledge I’ve made mistakes and I own them. I take responsibility and I am working to do things differently. I am choosing to let go of the guilty emotions that keep me stuck and tied to the past; that keep me from moving forward in my parenting and my relationship with my child.” Because in the end, guilt will only erode your relationship with your child, not strengthen it. Kids are very perceptive. They pick up on our emotions. Oppositional-Defiant or Conduct-Disordered kids may even purposely use that guilt to push your buttons. Until you move on from guilt about the past, your child cannot move forward either. In today’s world, blame is everywhere. Listen to conversations going on around you – on the bus, in meetings, on television, between relatives. Chances are some comment is going to be made about who is to blame about any given problem. Parents – particularly of a child who may be making poor choices or behaving negatively – are often blamed for their child’s behavior. 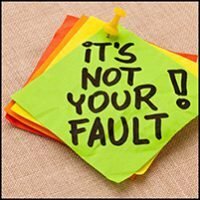 Many of us internalize that blame and feelings of shame and guilt take deep root. It’s good to take responsibility for your parenting behavior. Keep in mind though– no one is perfect and there are endless opportunities for us to pick out things we’ve done wrong. Recognize not only your mistakes, but your successes as well: a time you did stay calm in the face of your daughter’s teenage attitude; a time you did follow through with consequences; a time you did stay patient after being asked the same question a million times. Separate feeling guilty from taking responsibility. When guilt does more harm than good, it’s time to let it go.